Are you looking for free plagiarism detector that is accurate enough to help you find duplicate contents? If you see, there are lots of plagiarism checker websites available that includes the online free plagiarism checker for students as well. Yeah, "Plagiarism" the name itself indicates the "stolen" or the "copied" content. It is really the most frustrating thing for those bloggers who create such a great original content. And it looks more disturbing when the stolen content gets higher values in search results than the original one. As linked with the plagiarism and the internet these days, you can't prevent your content from being copied as anybody can copy it without permission, but you can see who is copying it & protect it. So here I am sharing 10 free duplicate content checker tool that you can use to check the duplication of content. These tools not only help you to test the website for duplicate content but also help you to improve any text & to remove grammar mistakes. With the free and quick analysis of your entire website; these online SEO content checker tools are best in finding internal & external duplicate content and check if your articles, essays, and website content are original. The analysis will show you the plagiarism statistics report after a full scan. It is important to ensure that the content is not plagiarized, so don't wait just proceed through the page and fix duplicate content, check copy for plagiarism, check content uniqueness and build a better website for better PageRank & increase Domain Authority. In the previous post we have seen Best 20 Blogging Communities To Promote That’ll Generate Huge Traffic To Your Website to build website traffic. And today we are going to view how to detect copied material from the blog post and how to raise the overall quality of the page. You must know that the search engines will NOT crawl your pages with duplicate content you have to make it unique and plagiarism free. The duplicate content might disturb your Google ranking. If your content is spread over the number of web pages on your or other websites, then Google or any search engine will not be able to know and decide what to rank first. So the duplicated/copied or similar kind of content results in a lower PageRank. No matter what plagiarism checker tools you use, but you need to make it free from copyright, grammar mistakes, duplications, syntax errors, etc. Use the following free plagiarism detection tools to check & get the detailed plagiarism statistics. So "cek plagiasi online". As usual, just copy the phrase of your blog post content & search as it is on the Google in double ("") inverted commas, e.g., ("phrase of a blog post"). Now the Google will serve you duplicate content SEO with some sites by showing you all the posts that contain that phrase. Free grammar checker, plagiarism checker & writing assistant - It is a multi-use best online plagiarism checker tool that every blogger and webmasters must have. It is most recommend advanced plagiarism checker tool where you can check not only copied content but also the grammar & spelling mistakes which additionally help you to improve your writing. Dissertation plagiarism checker - Smallseotools is all about the originality of content. Lots of users specially bloggers are benefiting from it every single moment to make unique their content. Identifying plagiarism was never that simple, here you just need to copy paste the content for the results by clicking 'search' button. You can use this as website plagiarism checker to scan your content. This best online plagiarism detection tool will then scans and examine each sentence, words & shows the results in the percentage. Signup and use it for FREE up to 1000 words. It is one of the most effective plagiarism checker for word document of your thesis you wanted to submit. Duplicate content detection tool - This is by far the finest plagiarism checker tool which has the tendency to shows the duplication of the published as well as unpublished content. Even it finds out the location of copied content with links. You require entering the URL of your blog post to know the duplication of your content. This is the best tool you need to use it once you publish the blog post. Copyright checker - Plagiarisma offers 3 ways to check duplication of your content. You can either search whole text or enter URL of your blog post. Even the files like text, Docx, RTF, etc. can be uploaded. It differentiates the original content with yellow color & duplicates with gray color. Over 190 languages are supported by Plagiarisma. It has the ability to detects copyright in your article, essay, coursework, research paper, or thesis. Plagiarism detection - It's an an innovative, quick, and easy-to-use online plagiarism checker tool. This one gives you the chance to paste content to be searched on the homepage. You can get very quick results (within seconds) by clicking on Quick search. It helps avoid plagiarism. It will only take a few seconds to check your document. It serves you with an email when your content gets copied. 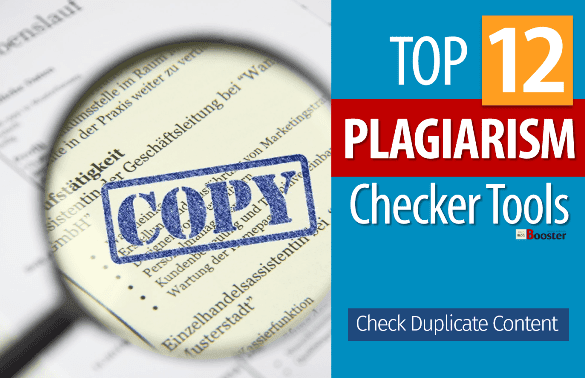 Plagiarize checker - This is easy to use free best anti-plagiarism detection tool where a registered member can do 50 searches a day. You can either enter the text of your content (limited to 1500 words) or upload a text/ Docx file to search your content against content duplication. With this tool also you can get the results within seconds. Plagiarism detector - This is the best duplicate content finder for students, writers, teachers, scholars, webmasters and especially for serious bloggers to check plagiarism and copied content. It shows the percentage of the copied material from the articles, essays, web pages, thesis or project reports. Here I would like to suggest before posting your blog post you must try this tool and check how much copied material you need to work on. Free online plagiarism tool to detect copied content - This is another one tool which allows the maximum of 1000 words to search in the search box to check duplication. It supports English & Spanish language at the moment. There is a limit for unregistered users to use it for the maximum of 5 times and a month where the registered users have the benefit of using it for unlimited. Duplicate checker - It offers a tool called similar page checker. As the name itself indicates that it checks the similarities between the pages comparatively. This tool allows you for determining the percentage of similarity between two pages. Essay Checker for Plagiarism - Here you are able to scan your web pages against the duplication. It is the best intelligent online plagiarism detection tool that works. Text & URL are the two ways to check duplication. Enter the text or URL & let it compare by clicking on 'compare' button. Accurate Online Plagiarism Checker - Unique algorithm to detect plagiarism - This system enables you to examine whether the written content is previously written on the web by any other user or it is unique. I know the number doesn't end here, there are still more tools to check duplication of content. Let me know if you know some different but working tools. If you used to write & publish blog pages or articles which have the contents that are NOT completely unique & original, then there is a higher chance of being blacklisted & penalized by the Google or other search engines. So, if your aim is to get at the top of search ranking in search engine results placement (SERP) — then it’s simply its worth to create and publish only original, fresh & new content every time.